A child being diagnosed with asthma can be a lifestyle change for them and for you. A lot of time will go into identifying triggers, learning how to treat your child, and learning how to handle flare ups. I hope that these tips help you and your child. Talk to your child about asthma: Give your child basic information about what asthma is in a way that is easy for them to understand. 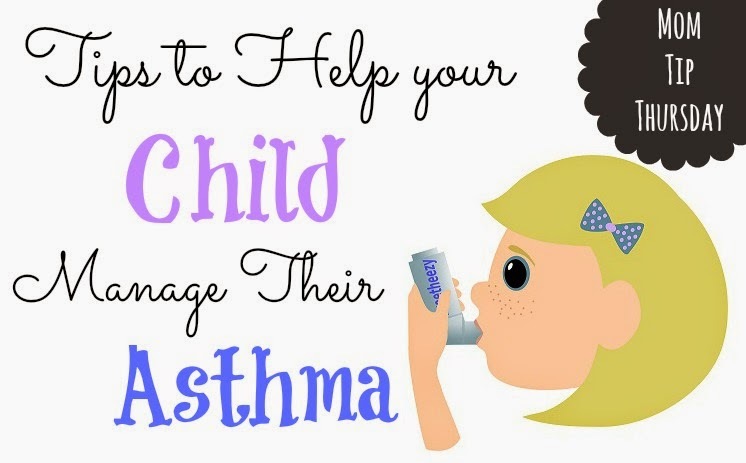 Discuss their asthma triggers with them and the symptoms that come from asthma. Since they will not handle their medication themselves it is not important to teach them how to use it but you can discuss why you are using each medication and what their routine is. Learn your child's triggers: Everyone responds to asthma in different ways so it is important to identify what is causing their asthma attacks. Once asthma triggers are identified it is easier for children to avoid. Some examples of triggers are pollen, dust, perfume, exercise, and weather changes; there are many more possible triggers these are just a few. Develop a preventative action plan with your child's pediatrician: Since every experience with asthma is different it is important for your action plan to be individualized for your child and the symptoms that they experience. Action plans should include avoiding triggers, what to do when early symptoms are identified, how to manage a full blown flare up, and know when to seek emergency care. It may also include using a daily preventative inhaler. Prepare for an emergency: Be prepared for a flare up with a quick relief medicine. Some symptoms of a flare up include wheezing, tightness in the chest, irregular breathing, shortness of breath, and restless sleep. If their asthma attack includes constant wheezing, changes in your child's color, trouble talking, or pulling during inhalation it is an emergency and you need medical help as soon as possible. Call for help immediately. Schedule follow up appointments for asthma check ups: Since asthma can change over time and by seasons it is important to schedule follow-up visits in order to assess and modify their treatment if necessary. Most doctors recommend check ups more often when initiating treatment and decreasing the amount of visits once the patient has their asthma maintained. This is a really good go to as a printable for reminders to parents! Great advice. I have to agree with the previous comment... this would be a great printable. My friend has asthma pretty bad, and spring time is super hard for her because she also has bad allergies. Great Info!